I’ve been playing proper Dungeons & Dragons for more than six months now, in a staggering display of a-regular-group-of-adults-actually-happening-regularly (albeit through the magic of the internet). While we’re playing the latest edition (5th), the familiar bestiary summons constant reminders of my first foray into that world — the classic computerised 2nd edition adventures that are Baldur’s Gate and its sequel. Playing the two games back-to-back, I was struck by one major contrast between them: the respective presence and then utter absence of “wilderness” areas. 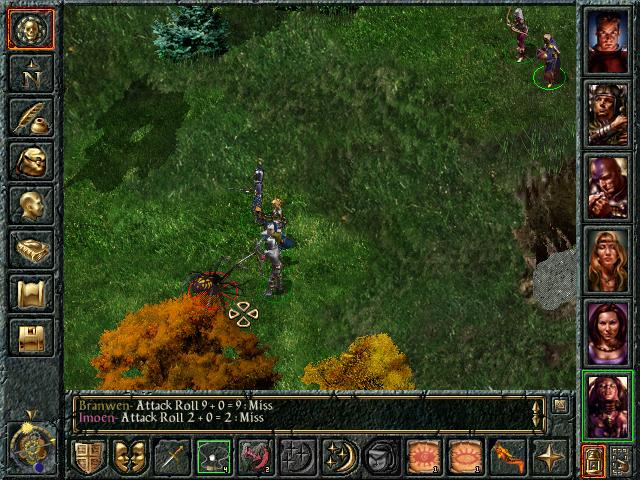 The Sword Coast region around the titular city of Baldur’s Gate is replete with wilderness. While the early parts of the game encourage you to stick to the safe main roads between the region’s big towns, sooner or later you’re going to be hardy (and perhaps foolish) enough to start exploring off the beaten track. After all, you’re playing as an adventurer — and where there is untamed land, there is adventure to be found. That’s the theory, at any rate. It’s always spiders, of course, but I guess they weren’t such an establish sigh back in 1998. I can understand why many are critical of the wilderness areas. 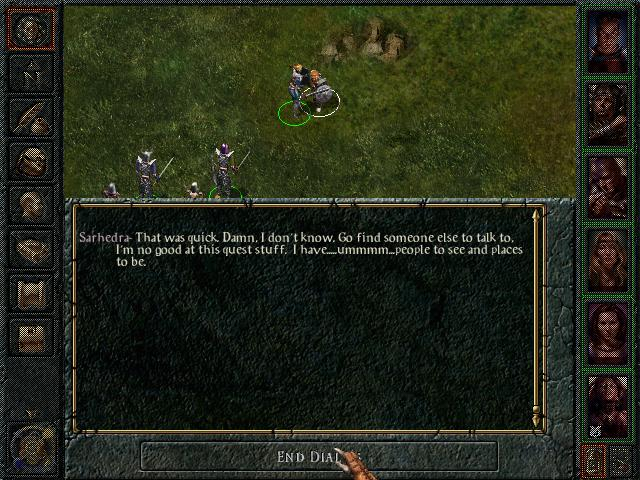 Baldur’s Gate is a big game but it’s not particularly dense; there is a lot of landmass to explore, and big chunks of that are devoid of any interest beyond the visual and atmospheric. All these outdoor areas are the same maximum size and most of them contain only one or two points of note, which you can only really stumble over by methodically quartering the region. Even finding the Boots of Speed doesn’t help with your ability to cover distance, as between those points of crafted interest there are randomly spawned monsters to contend with. These tend to take time but not much skill; they’re mostly comprised of basic monsters like wolves, kobolds, gnolls and the odd bandit. Well, it wouldn’t be wilderness without a bit of a wild side, right? Even the writers running out of quest ideas is delivered with amusing panache. 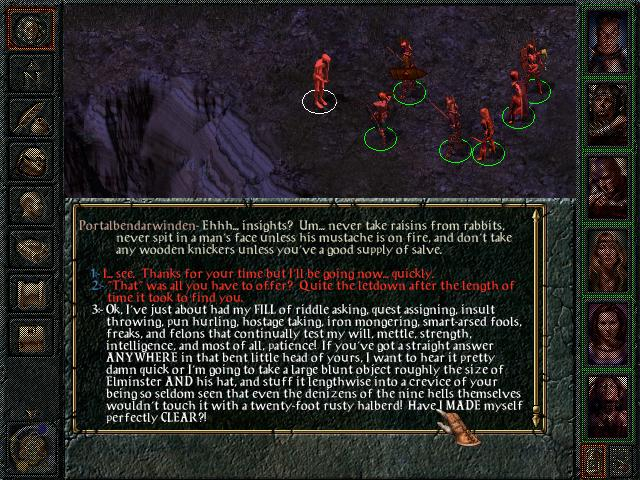 Hilariously, sometimes the hand-crafted points of interest are very difficult combat encounters against equivalent groups of adventurers and mercenaries. These you definitely do not want to stumble into, as even a well-equipped mid-level party needs a bit of preparation time to buff up before a real battle — but they often stand around in arbitrary places that don’t make it clear that you should start getting nervous. 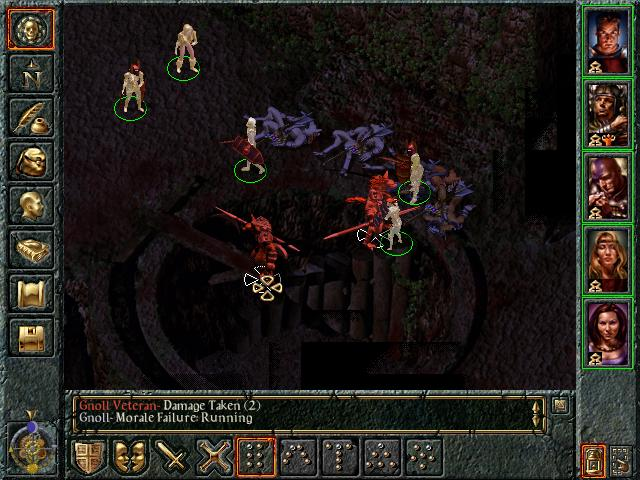 So yes, lots of wandering around doing not a lot, sprinkled some surprise beat-downs, mean that the wilderness areas of Baldur’s Gate probably do deserve some flak. However, I would argue that they are a critical part of the game. 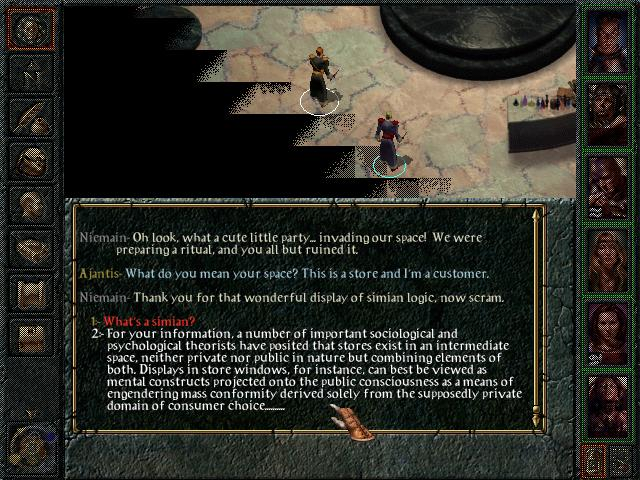 The main plot arc of Baldur’s Gate only has 8 chapters and maybe three times that many plot beats — for all that you’re tracking down a villainous conspiracy that has caused months and months of chaos along the Sword Coast, if you hammered the main quest and nothing else you could probably finish it in maybe 30 in-game days. But no little party of six could take down a major conspiracy in a month, that would be silly. Luckily there is an escalation of difficulty in the main quest that outstrips the experience points and equipment you get for pursuing it alone, meaning that you simply have to leave the roads to get ahead in life. Though I’m talking about wilderness here, I think the same principles apply to houses and pubs. Some of them are devoid of interest, others contain jokes that will stay with you for life. The interesting ones are all the more powerful for all the empty ones surrounding them. The wilderness then gives you a sense of grandeur that wouldn’t be possible if you simply teleported between the hubs of civilisation. 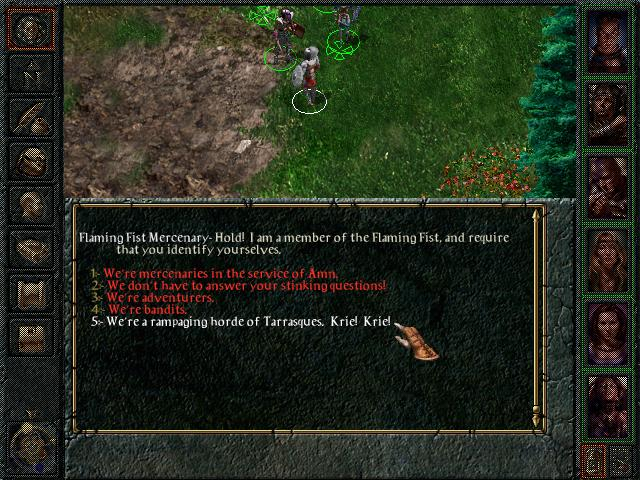 Apart from the size of maps in raw playable space, the game maintains a calendar, a count of days and hours your character has lived and travelled on this adventure. Wilderness areas are not always contiguous; although you must get through one area to unlock the next, each is generally 4 hours of travel time apart. Bounce around a lot and you’ll see that calendar rack up the days. There are no time-critical quests in the world so it’s never a problem, but when you look down and notice you’re more than a hundred days in it puts everything in perspective. Suddenly, those random spawned monsters make sense — they break your flow, force your party to rest more often, increasing that counter yet more. It might just be a number, but it’s one that turns that sense of scale into game reality in a way that few other games have managed. If you don’t wander the wilderness, you’ll miss some spectacular chunks of dialogue. Regardless of my opinion, sequel Shadows of Amn went hard in the opposite direction and contains no wilderness areas at all. 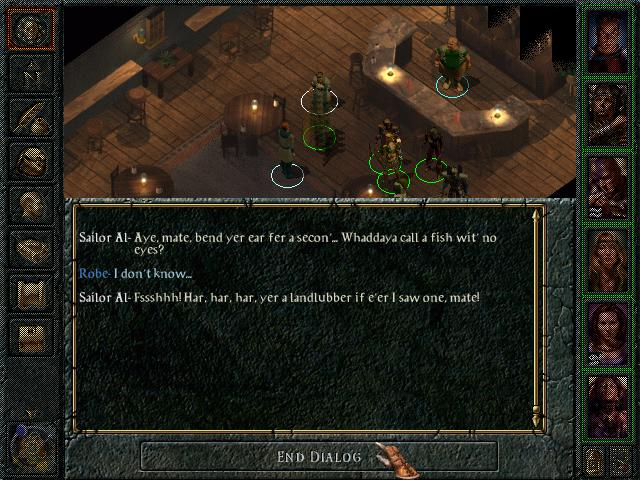 The major focus of the game is the city of Athkatla, which contains eight sub-zones to the mere five of the original Baldur’s Gate. This might give quests inside the city plenty of room to spread out — but crucially, it takes zero in-world travel time to get between them, so the days don’t mount up in the same way. Even outside the city, there are only three areas on the rest of the world map that offer more than one quest. One is the town of Trademeet, which is as dense as any region in Athkatla but is not wilderness; the others are the Umar Hills and Windspear Hills, both of which are presented as wilderness but contain so many quest points that they feel tiny. The wyverns took more damage from compatibility issues than they ever did from my spells. All of which makes Baldur’s Gate II seem so much smaller. There’s no arguing that there is less downtime, that the game is more focused, but I’ll argue that such focus loses something of the scale that made its predecessor so exciting. After the first moments of the game, when you emerge into this huge city and wonder where to go next, there are very few areas to be discovered and everything after that is a return to familiar territory. Even though the city is fundamentally large, it still counts as one place in your head. The other thing that niggles at me is how such focus ends up revealing the underlying structure of the game. The density of each region means that every named character sticks out from the villagers like a sore thumb — they don’t even need the yellow exclamation marks of Warcraft III to scream that they’re going to either offer a quest or be the target of one later. Hmm, yes, it seems that, by this rambling definition at least, even a shop can actually fill the same niche as a wilderness area. Contrast that with the slew of wilderness areas in Baldur’s Gate. The player will likely only visit each one once or twice, meaning that each time you decide to strike out is another opportunity for genuine surprise. You have very little idea on entering most wilderness areas whether or not you’ll find something special — you’re as likely to find a few wanderers who give you tips about life as you are to accidentally depopulate an entire Xvart village, or find a genuine side quest with a nice reward. The other structural reason I’d cite for wilderness areas is that they provide a half-way house between dungeons and cities. You can wander safely around cities with your guard down, while in dungeons you must inch forward alert for the most deadly enemies. Wilderness areas provide a grey area in between, where there are not traps under every stone but there are still dangers lurking somewhere. There is still that frisson of trepidation as you explore, but it’s not as intense and stressful as a full-on tomb raid. Never mind trying to make D&D adventure films, do a Tarrasque movie in the style of Godzilla. I will caveat that some games are too big and perhaps Baldur’s Gate has a couple too many wilderness areas. I can understand why they cut them in the sequel — it can’t have been cheap to produce all those luscious half-3D, half-hand-painted environments, especially knowing that each one couldn’t be reused and would hardly even be revisited. So too does Shadows of Amn make up for their loss by sending you to oddball places like the Sahuagin city, the Planar Prison and the Underdark — though these are gated by quests rather than open lands to be visited at your own whim, which makes them feel much less… well, wild. The most fascinating thing about the Sahuagin city is not that it’s completely optional, it’s that characters in the game deliberately discourage you from following the path that ends with it — you can skip straight to the Underdark. 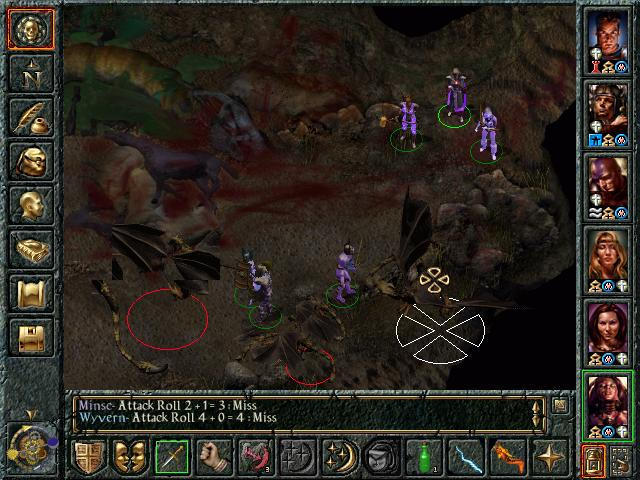 This entry was posted in Gaming and tagged Baldur's Gate, bioware, black isle, Infinity Engine, Shadows of Amn, Throne of Bhaal by Rao Dao Zao. Bookmark the permalink.